Online services such as Office 365, G Suite, OneDrive, Box and Salesforce, bring the power to the cloud. However, they are also accompanied by unwanted elements of risk in the shape of limited backup and archiving processes necessary to restore data once manually or automatically removed from your recycle bin. Cloud Ally’s backup and recovery solution ensures that you can backup and recover data from any point in time to unlimited Amazon S3 storage. Why choose Cloud Ally Office 365 Backup over the rest? The primary issue with online services, such as those mentioned above, is that their restorability is limited by their data retention. Most cloud services rely on the recycle bin to recover from, the issue here is that once that is purged (manually or automatically) your data is lost. We offer a simple, reliable, seamless and affordable backup solution for your online Cloud Services. Our qualified and experienced team are on-hand to consult and implement Cloud Ally Office 365 to ensure your data and information can be recovered, restored and kept secure. Ever experienced disruption or additional costs that directly impact business, data loss or corruption? If so, then you’ll know how crucial it is to protect your business information by backing up and securing regularly. This process may already be in place but where are you storing your backup media? It is well documented that your data backup strategy is only as good as your media storage. 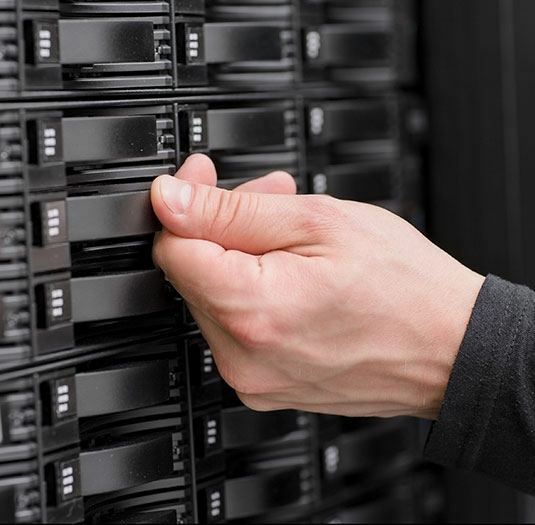 Storing your media ensures data that has been backed up is protected from the many security and environmental threats such as heat, humidity, electromagnetic interference, theft, slow recover times when restoring and fluctuation in temperature. As your most valuable asset, we recommend the adoption of our backup media storage solution that you can trust. We have built a strong partnership with DataBank; the leading media storage supplier in Australia. Not only providing you with a state-of-the-art storage facility, but dispatch a trained professional in an air conditioned, secure vehicle to collect your backup media and rotate accordingly. With Synergise IT, rest assured knowing your backup media can be retrieved 24/7 when the need to restore data is required. Your media can be delivered to you within a 90-minute timeframe to have you up and running should the unexpected occur. We oversee this entire process at no additional cost, ensuring peace of mind. It’s time to power your business with industry-leading IT server and storage solutions. No two servers are alike, every businesses needs are different and many custom options exist to suit these requirements. You may be considering a 10GbE upgrade, fibre vs. copper, whether to run RAID5 or RAID10 disk sub-systems. Is there a benefit in running 15K disks over 10K? Do I require full lights-out / out-of-band management? There are many complex questions and options that exist for server technologies and we have the answers and experience to spec, build, test, deploy and manage your first server, or adding to expanding data centre of compute resources. Synergise IT have been using and recommending HPE’s range of servers and storage for Australian businesses for approximately 2 decades. HPE continue to produce quality machines for business with regular product updates utilising the latest technologies available, at a competitive and cost-effective price point, backed by a strong warranty and support division. Synergise IT are well versed with the HPE series, models and the various complex options available and can custom build a specification to your exact requirements or adding to expanding the data centre of compute resources. Microsoft Azure is a comprehensive set of cloud services utilised for building, deploying and managing applications through an on-demand data centre. Always evolving and improving, every iteration offers an opportunity for your business to move faster, reach new heights and save on cost. With the ability to tap into over 600 Azure services, Synergise IT can achieve your requirements. Servers and Virtual Machines: Azure virtual machines enable an SMB client to expand the data centre to Azure. VMs can be used in a variety of ways, from production to test/dev. There are several advantages to using Azure VMs over on premise virtual machines. Backup: Azure backup provides an easy and automatic backup for servers, desktops and laptops, and Azure virtual machines. Disaster Recovery: Azure Site Recovery enables us to make a replica of our on premise VMs in Azure. Remote App: Using Remote App in Azure, we can publish your line of business applications using the secure and familiar Remote App interface and keep data secure in Azure or on premise. Enterprise Mobility Suite: Combines three standalone Azure products – Azure Active Directory Premium, Intune, and Azure Rights Management. Combining these 3 services facilitates you to control and manage devices, users, and data. With a long standing local Australian presence and ease of integration with existing on-premise Microsoft technologies and products, Azure is the go-to public cloud choice for Australian businesses. Let us take you there! Whether you are in the growth phase of your business or start-up, it is imperative that you have a rock-solid IT infrastructure in order to have the necessary tools, hardware and potential to increase business growth. As IT encompasses a vast majority of elements, storage is the lifeblood to ensure your business moves forward. At Synergise IT we are well experienced and versed with QNAP and their extensive range of storage solutions. QNAP (Quality Network Appliance Provider) deliver comprehensive offerings of cutting edge network attached storage (NAS) solutions. From ease-of-use and robust operation to large storage capacity, QNAP solutions are both trustworthy and reliable when integrating technologies and designs to bring forth quality products that improve efficiency on file sharing, virtualisaton, applications and storage management in the business environment. Our experience working with QNAP products allows us to customise storage solutions that meet your requirements and exceed expectations, ensuring your business takes to new heights. Every business requires a backup and disaster recovery solution that adapts to an ever-changing IT environment in order to have systems up and running fast after disruption. At Synergise IT, our vision for your backup and disaster recovery needs are focussed on ensuring fast, reliable and complete solutions that are both practical and affordable. StorageCraft’s ShadowProtect provides backup and disaster recovery, data protection, and managed system migration for Windows systems on virtual and physical machines. Recover systems, applications, and data to the same or different hardware or virtual environment. Back-up & capture everything: Systems, applications, configuration settings, services and data ensuring the minimal risk of losing irreplaceable data, custom applications, or your operating system. Scheduling: The ability to run backups regularly whilst your employees are working and never risk losing more than a few minutes of data. Recovery: Recover files/folders or restore an entire system fast to either the same or different hardware avoiding downtime and additional costs. Management: Backup files need to be managed in order to prevent file failure when a recovery is required. Utilising the combination of StorageCraft ShadowProtect and StorageCraft Image Manager, we routinely verify backup images to ensure they are in a known good state for fast and reliable recovery. As IT professionals, our consultants utilise the fundamental tools required to make business continuity a reality for your customers. Our experience with StorageCraft ShadowProtect enables us to reduce your downtime from days or hours to minutes through the delivery of fast, reliable and complete data recovery solutions.